Editor's note: Today, we're sharing a classic essay from our friend and colleague Dr. David Eifrig. This piece is adapted from a November 2015 issue of his daily e-letter, the Health & Wealth Bulletin. In it, he shares a valuable lesson that investors should always keep in mind. 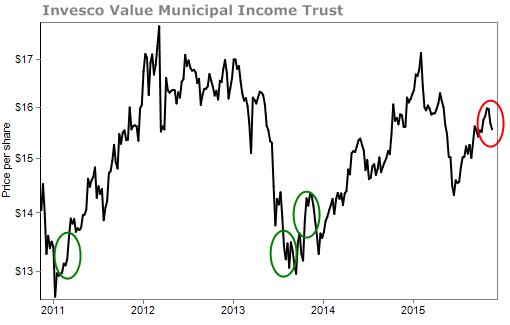 "What is happening with Invesco Value Municipal Trust (IIM)?" he wrote in an e-mail. "Doc Eifrig has been a proponent of this fund for several years. Since the first of November, the price has been rapidly sinking." IIM is a fund that holds a portfolio of municipal bonds, an extremely safe income-generating investment. It's been one of my favorite vehicles for safe, steady income. And it's been a wildly successful investment, especially considering how safe it is. Whenever we publish a recommendation, our readership usually sends a few e-mails punching holes in it. I love to read them. They're valuable to my mission of finding you income-generating investments that help you sleep well at night. A quick look at this chart should tell you that this decline is nothing to be concerned about. 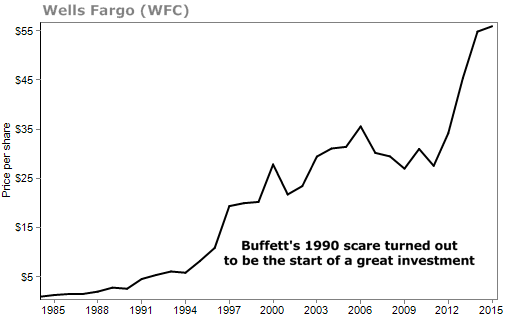 If you do get worried about declines like this one, I've got a simple way for you to become a more successful investor. It's one asset every great investor has, and it's nothing you can buy on E-Trade. The asset is this: Reasonable expectations. You determine what counts as "successful" for your investments. A lot of new investors need to set that bar at a level they can actually reach. Many investors expect to earn untold riches in the market. You need to make an honest assessment of what's possible. For instance, from 1926 to 2013, a portfolio that had 60% stocks and 40% bonds returned an average of 8.9% a year. If you are expecting to earn a rate much higher than that... like 50% a year... you've set your sights way too high. In some cases, this can be harmless. But high expectations can lead investors to save too little for their futures. Also, inflated expectations for returns can lead investors to take on too much risk. Rather than grow their portfolios quickly, they blow them up. Investors with high expectations also expect every stock they own to rise constantly. That simply doesn't happen. 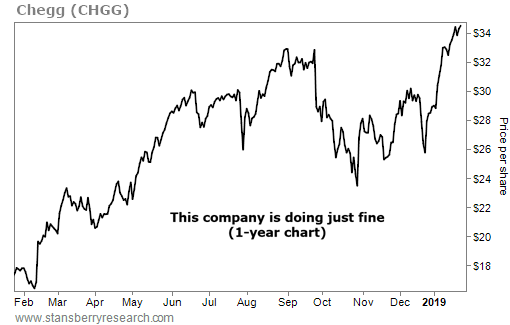 First, you'll have nearly as many stocks go down as go up. Even top investors would be satisfied with a win rate of 55% or 60% – especially if their gains are bigger than their losses. Second, even your best bets won't march straight upward. 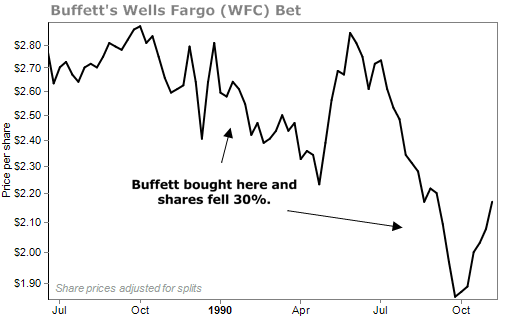 Rather than panic, Buffett held on. Now his shares of Wells Fargo are up about 4,000%. Or, another example: That 60% stocks/40% bonds portfolio we mentioned lost money in 21 out of 88 years, or 23% of the time. If you expect your investments to return 20% a year with no losers and no down years, you will never be a successful investor. Your definition of success cannot be achieved. To become successful, you have to embrace the fact that investments go up and they most certainly go down. With wise asset allocation and diversification – and an appreciation for the bumps in the road – you can earn returns that can lead to a comfortable retirement over time. Your success starts with how you define it. Editor's note: This week, Doc hosted an urgent market briefing to explain why now is the time to add safe, income-generating investments to your portfolio. If you couldn't tune in to hear his latest warning, you're in luck... For the next few days, you can watch a replay of the event right here. "I'm not saying a market crash or recession is coming today or tomorrow," Doc says. "But I'm seeing signs that the economy is reaching its high-water mark." Learn more about his plan to prepare right here: How to Survive the Coming Drought. "I believe the recent downturn showed us something important," Doc writes. "Now is the time to get defensive." And with lower prices, he says now is a great opportunity to load up on one of his favorite types of investments... Read more here. Chegg (CHGG) is a $4 billion jack-of-all-trades in the education technology sector, offering everything from textbook rentals to online tutoring. In September, the company discovered an April data breach had affected about 40 million of its users. Shares dropped 30% over the next several weeks. Now, some time has passed… And all it took was a little good news for shares to recover. In October, Chegg reported a 45% jump in subscribers during the third quarter… And quarterly sales jumped to $74 million, a 19% increase year over year.